Turn of the century picture. 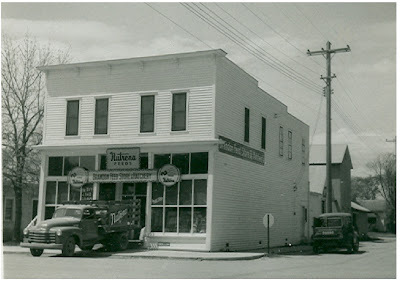 Ruppelius General Merchandise store was on the corner of Front Street and Central Avenue. 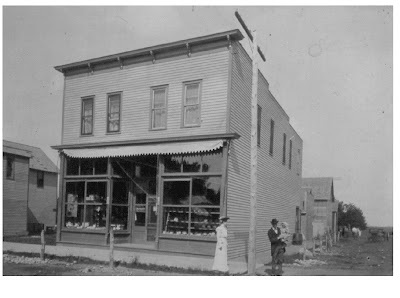 In 1880's the corner business was a CoOperative Store. In the early 1900's it was Rupplelius & Leitzinger General Merchandise. Holmgren and Christensen became owners of the building in later years. This is the present location of the Brandon U.S. Post Office. 108 Front Street. It is the third building in this block on Front Street. This post card is dated 1909. Notice that the Larsen, Peterson & Co. is the third business on the block. Approximate address is 108 Front St. The Echo - - - - Brandon, Minn. 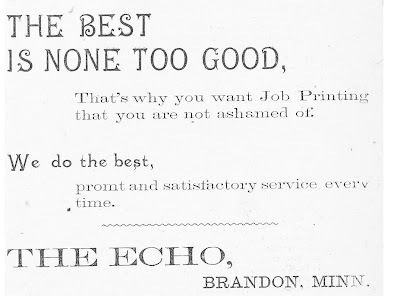 The Echo was advertising for printing jobs in the early 1900's. 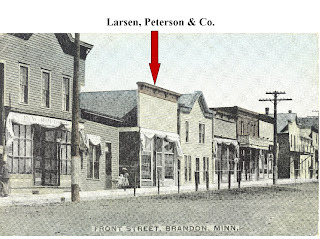 This building was constructed in 1898 at 109 Central Avenue North in Brandon. There were living quarters upstairs with both an inside and an outside stairway. A well was dug on the south side of the building and the pump was installed on the second floor landing or porch. 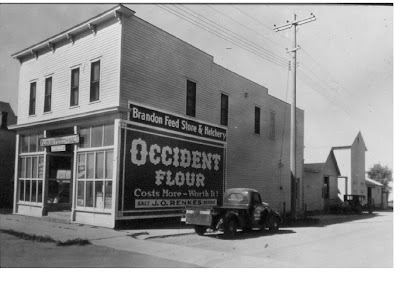 Carl A. Wold and his brothers, John, Ole and Pete, were engaged in the general merchandising business in this building for seven years, and at this time Carl published the Brandon Echo. Three years later he moved to Alexandria where he reorganized the paper and named it the Park Region Echo. 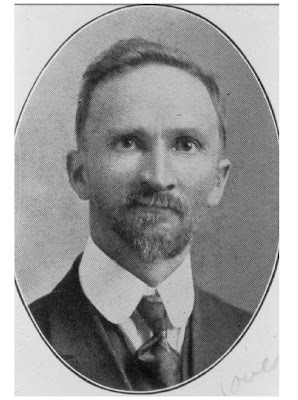 In 1914 he became a member of the Legislature. His wife, Eva Emerson Wold, was at one time Douglas County Superintendent of Schools. No exact date has been found as to when the building was converted to a feed and seed store. 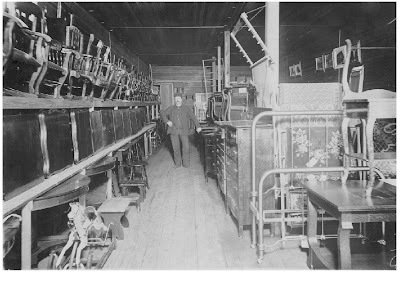 Albert Haber was the manager of the business when John Renkes came to work in the mill J.O. 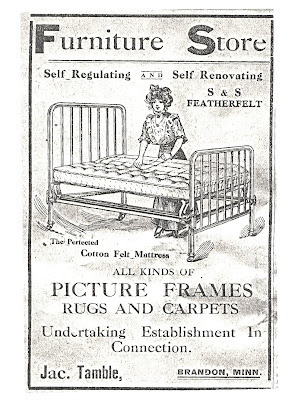 Renkes purchased the business in 1920 and continued to run it until 1977. The building was taken down in 1986. 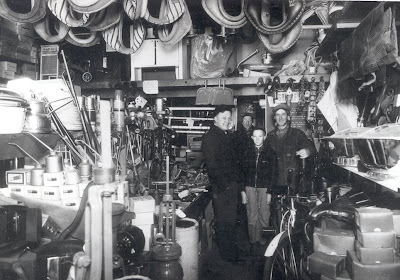 Owner of the Wold Brothers General Merchandise Store along with John, Ole and Pete Wold. 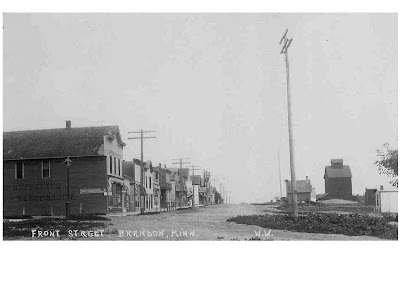 Carl began to publish the Brandon Echo in the late 1890's. Later he moved to Alexandria where he started the Park Region Echo. 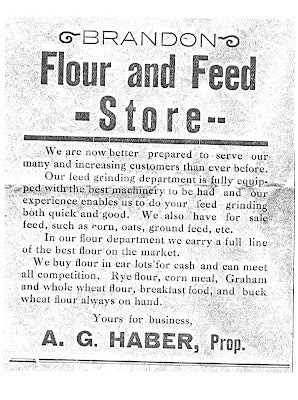 A.G. Haber ran this advertising in the local newspaper while he was the proprietor of the Brandon Flour and Feed Store in the early 1900's. 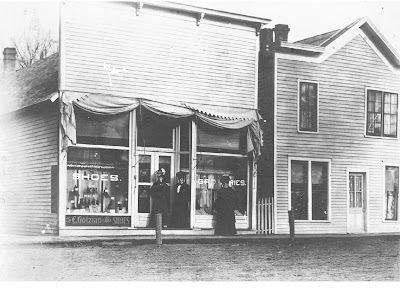 Two views of the building in the years that J.O Renkes operated the business. 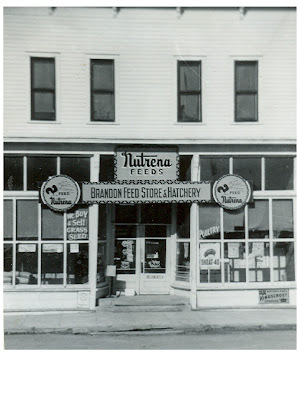 J.O Renkes purchased the Brandon Feed Store & Hatchery in 1920 and ran it until 1977. This building was taken down in the later 1986. Jacob Tamble Furniture Store was located at 105 Central Avenue in Brandon Mn. This store carried a full line of fine furniture.